Want to create a printed piece that incorporates eye-catching imagery with amazing color? Check out B.R. Cohn Olive Oil Company's latest catalog for your next great marketing inspiration. Businesses need their print pieces to rise above the rest with unique color and creative design. What most don't realize are the possibilities that are available, even within four-color process printing. Using 4 color printing technology, PFL can create a wide variety of colors. In this featured piece, a deep yellow color was printed over a solid black backdrop. The result is a striking image that almost appears to be the color of gold. While this effect does not shine like foil or metallic ink, it is a very cool look at a fraction of the price. Think you have to use expensive foil or metallic ink to get a prestigious looking product? Think again! B.R. 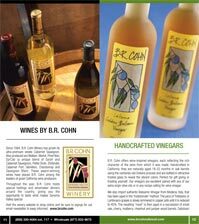 Cohn Olive Oil Company produces artisanal quality products including flavored olive oils, wine-inspired and balsamic vinegars, and a line of gourmet foods. 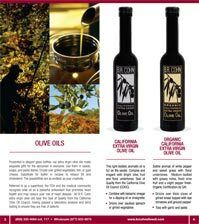 The company has greatly contributed to the emergence of California Olive Oil as a global competitor. B.R. Cohn is a brand that exudes elegance and refinement, and their catalogs needed to evoke that same look and feel. This catalog features chic, retro style imagery that shines with simplicity and style. Customers are drawn to this solid gold-on-black design that truly pops to the eye. Product Images and Technical Specifications This piece provides the customer with an extensive product inventory and focuses on branding B.R. Cohn as an upper echelon manufacturer. Inside the catalog you'll find high quality images of the B.R. 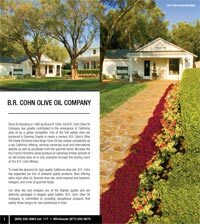 Cohn property in California, along with a description of the company history; and a detailed summary of products. Catalog with pocket - The essence of this catalog is to pique interest in the company and provide the best information about its products. The bottom half of the inside back cover is a folded pocket with slot for a business card and additional info sheet. This is a great place to insert updated product information in the future, without printing an entirely new catalog. General company contact information is featured along the bottom margin of the pages, as well as on the back cover. Striking cover image - The cover of this catalog is an excellent design, and is a true example of getting the most out of the four color process. The deep yellow color actually appears to be gold, especially laid over a solid black backdrop. This fits perfectly with the deco style image and font to create an overall feel of elegance. Quality product images - Inside, the piece features brilliant images of the B.R. Cohn property, and the many quality products they offer. These pictures are bright, detailed, and created with the four color process. Images like these are fantastic examples of how far four color printing can go to captivate the viewer. Can you think of an incredible image that can't be ignored? Put it on paper and pull in the audience! Custom catalog size - The compact 4 x 9" catalog size is easy to hold and use and focuses the attention on only a few products a time. If you are wondering about the full possibilities of the four color process, give us a call and let one of our designers show you some examples that illustrate the range of possibilities. Everywhere you look in this catalog you'll find contact information. Company contact information appears on the bottom margin of every page - with the business card popping out at the reader from the slot on the inside back cover. The viewer is either learning about the company's quality, or finding out how to best reach out to them. After reading this the customer is saying "this looks great, I want some!" Don't forget the amazing range of the four color process. If you can dream it, PFL can do it! And remember, just because a piece looks expensive doesn't mean it has to cost a lot. For example, when looking at the B.R. Cohn catalog, most would assume a metallic ink was involved, or some type of specialty process. Instead, by using unique color combinations, cutting edge design and a little imagination, they were able to create a truly eye-catching printed piece without breaking the bank. B.R. Cohn's website states their products are "of the highest quality, and distinctly packaged in elegance" With this catalog, the elegance continues. Some of the inside pages showing the nice product presentation. Need help or ideas for a custom catalog design?